That's the best I could do after two hours of trial and error. I'm not showing the other hand cos it looks like Alden's painting. So what do you think Kay? The background of this pics makes your colourful finger 'alive'! thru my eyes,cantik bah. ngam lagi the colors combination ni. You know when i saw this update via my reader, i thought it was one of those updates from the nail art websites i subscribed. Sekali i read the header back...ko punya pula! Really. Very nicely done. And yes, love the colors. Ngam ko kasi match. Very pretty! One of this day...gonna try to beautify my poor poor nails. 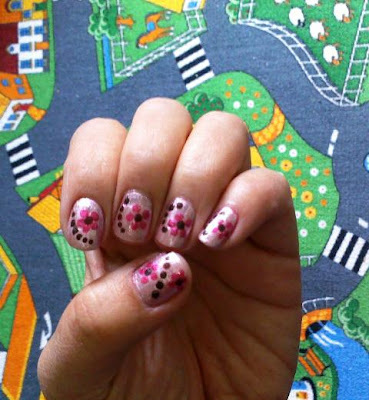 pretty nail arts :) rajin ko oo moi..
hmmm nanti sia try bikin video tutorial on the cherry blossoms this weekend. Cath-2 jam tu Cath..sengsara juga sia rasa mula2 hehehe.